Our solar system formed 4.6 billion years ago, but how did this happen? Brendan - So, this is a selection from our Deep Space category from astronomy photographer of the year as a selection of star birth and star death. Graihagh - There are some beautiful colours. I can blues and yellows, red, very, very rich. Brendan - It's kind of amazing and maybe a little disappointing for some people sometimes is that the colour that you see in a lot of the images is what we call false colour. Those photos are corresponding to just particular energies from particular atoms - so iron, carbon, oxygen, and then you can choose to colour them in. Just to avoid confusion, we don't go all creative and colour them whatever we want. We try and stick to a palette called the Hubble palette. So, we all kind of recognise what the different colours are. So typically in images, the reds, and pinks, they can be hydrogen. Sometimes a different shade, it can be neon as well. If you have something like oxygen sometimes it's green or blue, so you can change them a little bit but they're just strictly so we can try to keep it to the same palette so we all understand. Graihagh - How do we get from these sort of beautiful clouds of dust to what we know today as our Solar System - our sun, planets, rotating around the sun? Brendan - Something has to trigger the collapse of the gas. One cause often is a supernova explosion from another star. Gravity pulls in clumps of gas and that starts to swirl, and it's a bit like when you take an ice skater, spinning, got their arms open, and then when they bring their arms in, they spin faster. When you get that, we're getting a squeezing and squeezing of gases and it gets hotter and hotter. So eventually, the star ignites so to speak, the stars getting to a temperature where it can fuse hydrogen into helium and start the process of a new star. But around it, you'll get a dusty donut. Graihagh - Now that we have a dusty donut around our star, the rest of our Solar System can begin to take shape and weirdly enough, what happens next in the story of our Solar System is incredibly similar to when you combine water, washing up liquid, and pepper. Join Brendan and me in our experiment. I'll give you a couple of seconds to get everything you need... okay, ready? Brendan - The first thing I'm going to have to do to recreate that idea of the gas collapsing and everything, swirling around, so we're going to have to swirl the water first of all. And then we're going to add in our planet pieces. So, our little dust pieces. We'll sprinkle that in around the area. Graihagh - In case you hadn't realised, our planet pieces are the pepper. So, get sprinkling. Brendan - The grains by themselves are quite small, but we can see that they're actually clumping together to form the early planets. Graihagh - How would that happen in real life? How would they start to group together? Brendan - Before gravity can take over, before they're big enough to have enough gravitational pull to pull in material, they actually do stick. They're smashing against each other. Everything is quite hot at this time as well. So, things are far more malleable than we think of them today as in rocks. So, more things are molten. So, they do stick together and you end up with a few - what we call planetesimals so really, the seeds of the planets that we have today. There is another step. We've took on the swirling around, we've ended up with quite a few planetesimals. Graihagh - We have, I was going to say. There are at least 20 or 30 in there. Brendan - And this is actually pretty good before everything settles down into the Solar System we're familiar with today, there's a bit of clear up job that's performed by our early star, the sun. It's what we call a T Tauri star and it's a young star that's actually got very powerful stellar winds. Every now and again, we'll get what we call solar storms, the gas from the sun material have been ripped off, these explosions that come towards the earth and across the Solar System. But it was much worse back in the early days. So what we're going to do is recreate those strong stellar winds by using washing up liquid and I'm going to put a little bit on my finger. The experiment is changing the surface tension of the water, but it's quite magical. I hope you're ready for this. Graihagh - I'm very ready, okay. Pop a bit of washing up liquid on your finger and dip it gently into the middle of the bowl of the water and pepper. Did you see it? It's pretty quick, but all the clumps have shut out from their random clumps in the water right to the edges of the bowl. There wasn't one planetesmal left but then how did Earth, Mars and Venus form? Brendan - It's a little bit exaggerated. It's known as catastrophic because in reality, you should be left behind with the biggest planetesmals. But what it's doing in this time and as the planets are forming, the stellar winds are clearing out excess gas dust. Basically, they're putting a stop to any further formation. Graihagh - What sort of timescales are we talking about from that initial collapse of a supernova and other sort of star coming by and the star collapses, and you've got this swirling dust, all the way to what we have today? What sort of timescale are we looking at? I imagine it's in an order of millions. Brendan - Yeah, actually relatively speaking. The early stages are in the order of up to 100 million years in that, getting to sort of the stage where you've got bigger pieces that can start to combine together into the Solar System formed today. But everything properly settled down, probably about 4.5 billion years ago or 4.4 billion years ago. So, it's still an incredibly long time ago that we've had that. So, things have settled down since then. So, altogether, we're talking about tens to hundreds of millions years' time to actually go through those stages. Now the wonderful thing is, that we've found recently that we can look at other planet systems in better detail than we have before. So, we found planets called exoplanets that orbit other stars. We can see those in their different stages of their lives. So, not just stars in different stages on their own, but also the planets as well. Graihagh - So, we've talked a little bit about how the rocky planets formed, but what about the gas giants like Jupiter and Saturn? Brendan - So, that is probably the most contentious area of planet formation theory, is trying to think whether or not which models suits best. So, there are two main models and one is called the core accretion model which is where the gas is falling on to the cores of the gas giants. So, a bit like the terrestrial planets but further out where gas can accrete onto these solid centres for the gas giants. A thing about that is, you need the time to allow that material to fall onto those cores before the young sun blasts away any of that material that would form the atmosphere around it. Alternatively, there's the disc instability model which is where if the disc around the sun can cool quick enough, it just clumps together to form the gas giants. But that relies on the disc cooling down fast enough again to beat the strong stellar winds clearing out the Solar System. So, we've got those two ideas for gas giants. Graihagh - So, moving beyond the gas giants then and to these icy planets that we know as Neptune and Uranus, how did they form? Brendan - So, they're further out. So, they are mostly caused of ice crystals in their atmosphere. They're even cooler so we think that they might have formed a little bit later even than the other gas giants like Jupiter and Saturn. We also think that there might have been an extra gas giant in there at some point. With planets moving around the young sun, if they're in sequence with each other, if you have say, one orbit of an outside planet, it's the same as two orbits of the next planet in. If they align with each other, they give a gravitational kick to the next planet out. So, we think we may actually have a lost brother in the Solar System flying off that we call a rouge planet. Graihagh - Is that like a comet and will it come back eventually or is it just gone forever? Brendan - It may be gone forever, depending on the kick it's got. We also have about - our closest star is 4 light years away, but that's just in one direction. So, if it went off in another direction, it's going to have a much longer journey to join up with a new planet system. There is that idea as well that planets possibly could be captured by another star system. So, this is really a speculation, a theoretical area of things, but there are theories out there, it still is possible. Graihagh - So there's many chance there might be a planet in our Solar System that might be from another star. Brendan - I think we've come to planets maybe that are further out. Not even planets or should I say, dwarf planets. We may have captured something else from another system so there may be one of those like Pluto that doesn't belong originally to us which would be quite amazing. I think it would be quite difficult to find out if that's the case. Getting, tracing again the nitty-gritty detail on how things formed is quite difficult when you start off like we did at the start of our journey with one big cosmic soup from an old star and who shared what, that's a tricky one to find out. But hopefully, technologies at least have been able to allow us to piece together the timeline better than we ever have done before. 11:26 - Should Pluto be classified as a planet? New Horizons' images of Pluto have reignited debate over the dwarf planet's classification: should Pluto be a planet or dwarf planet? Should Pluto be classified as a planet? David - There is a simple yes, no answers as to whether Pluto is a planet. The trouble is, the no answer has upset a lot of people. Graihagh - That's David Rothery, professor of planetary science at the Open University. The reason it's difficult to say is not just because of the politics involved, but also because we seem to have an inordinate fondness for Pluto. David - Pluto is an icy world. It's smaller than the big icy moons of Jupiter, just over 2,000 kilometres across. Its density is such that the inside must be rocky but the outside is icy. Now at the surface, there is some water ice sticking up, forming mountains, but most of the flat line regions of the surface, are other ices - nitrogen ice, methane ice, and carbon dioxide ice. It takes 248 years to go around the sun, so it's got very long year, very long seasons. Graihagh - And of course, if I landed, I'd never make it past 1 year old, technically in Pluto's definition either. David - You'd be forever young. Graihagh - Forever young. How did Pluto become discovered so to speak? David - After the planet Uranus was discovered by accident, and it had been tracked for a while, people realised that Uranus's orbit wasn't quite right. There must be something beyond Uranus perturbing its orbit and they looked in the right place and found the planet Neptune. After Neptune had been tracked for a while, people realised that its orbit seem to be not quite right and they thought there must be an unknown planet beyond Neptune. So, they started looking. Percival Lowell started a big campaign which outlasted his life. And a chap called Clyde Tombaugh got the job of photographing the bit of the sky where this mysterious planet X ought to be. Eventually in 1930, he found it. Graihagh - Hence, Pluto was born. How was it named? I was about to call it she then. How was she named? How was Pluto named? David - Well, the suggestion came from an English school girl called Venetia Burney. I don't know the background of why she came up with the name, but it seems obvious with hindsight that all the planets are named after gods and goddesses from the Greco Roman pantheon. We've got Saturn, Uranus, Neptune, Pluto - the body in the dark, out of reach was given the name of the god of the underworld. 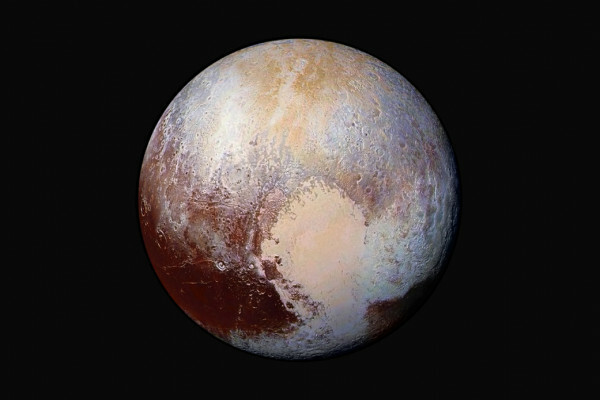 It seems perfectly natural and it was embraced all the more willingly because it meant that the abbreviation for Pluto would be PL which were the initials of Percival Lowell, the guy who started the photographic survey campaign which eventually led to Pluto being discovered. Graihagh - Like me, you may have noticed that all these astronomers are American. I wondered whether this might have significance when trying to unpick why people were so upset when Pluto was declassified as a planet. David - Well, other planets had been discovered by Europeans. Well, Pluto was the American planet. So I think, now that Pluto has been declassified as planet, Americans in particular fairly agree that their planet has been taken away from them. Graihagh - How did this come about? Why was Pluto declassified? David - When Pluto was first found, it was the only thing beyond Neptune. Pretty soon, it became clear that its orbit would come inside Neptune and that the estimated size of Pluto first of all, thought it was something earth-size or mars-size and it kept shrinking and shrinking, and shrinking as we got better determinations until we realised it's even smaller than our moon. But the real killer for Pluto came in the 1990s when we began to discover other objects in similar orbits. 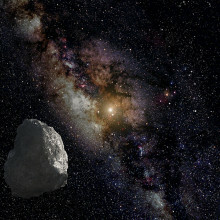 So, there was a whole swarm of objects out there, in the region which we call the Kuiper belt. These are leftover remnants we think of when the planets were forming. So, what we now have is Pluto as the largest of the objects in the Kuiper belt. Graihagh - But if Pluto isn't a planet then what is it? David - In my mind, Pluto is just a large Kuiper belt object. But in 2006, when the IAU came up with this definition of what is a planet and therefore what isn't a planet, they inserted an extra category. They said, something which hasn't cleared its orbit, we will call a dwarf planet if that object is sufficiently big, that its mass is strong enough to pull the object into a round shape, into hydrostatic equilibrium. David - Yeah. "Hey, Pluto!" is what Mickey Mouse used to say. Mary - I like it as a planet. It suits the system. Fran - How about redefining planet to include Pluto? Graihagh - Let's take Fran's comment first. What would be the main objection to redefining planet to include Pluto? David - I think it would be very hard to construct such a definition except by adding a clause in to say, "But by the way, we'll still count Pluto as a planet" because Pluto shares so many characteristics with lots and lots of other Kuiper belt objects. Unless you say, "on the basis of historical precedent, because we called Pluto a planet for 70 or 80 years, we'll keep Pluto as a planet but we're not admitting any other bodies to the same category." Graihagh - And I suppose one thing here that we haven't really talked about is that actually, these missions like New Horizon and all of these things are actually publicly funded. So, if that's what the public want then why not? David - Yes. It's the American public, American taxpayer funding the missions to Pluto, but of course, that doesn't give them ownership over the Solar System. And that's why the international body, the IAU is in my mind the appropriate body to adjudicate on this. Ciudin - Is that really the question that bother us? I think we should use our brain for something more concrete. Andrew - It doesn't matter in the slightest what you classify it as. Graihagh - I think I agree with these two comments. Ultimately, it seems a game of semantics and whether Pluto is really a planet or a dwarf planet, it doesn't really matter. Ultimately, it's something fun and interesting to study. David - I certainly agree with that. Pluto is a superb place. There's so much there that's being discovered. Even if we found flocks of penguins dancing on the ice, that would not make it a planet on the IAU definition. Get on with it. It is what it is. I'm a planetary scientist and I will happily study Pluto. However, it's classified. The New Horizons probe has provided vast quantities of data on Pluto, but what has it told us that we didn't alread know? Alan - Well, New Horizons and a mission to the Pluto system spent about a dozen years seeking funding. The scientific community backed it very strongly, but a whole series of previous missions, some of them very fine missions collapsed for one reason or another. It wasn't the right NASA administrator. It wasn't the right funding time. But fortunately, people really persisted, the scientific community really stood up for this over and over, over again. In the end, because the National Academy of Sciences ranked this mission as the number one priority, we were funded in 2003 and that concluded that long battle from the late 1980s into the early 2000. Graihagh - That must have been really hard for you. Why did you and your colleagues keep persisting? Alan - Really, there were two reasons in my case. One was the science. It was so convincingly luscious and secondly, the opportunity to do a first exploration mission is essentially unheard of in our time. It's something out of the '60s and '70s, and '80s, and that was very attractive to many people to have a chance to be on a mission like that to be able to make really big discoveries. And so, people were really willing to back it and to persist to back it. Graihagh - And why in particular Pluto? Alan - Even in the late '80s and '90s, we knew that the Pluto system was a binary that it had formed very likely, very much like the earth-moon system so it gave us a chance to see an analogue of that giant collision process. We knew that Pluto had multiple ices on its surface, we had discovered Pluto's atmosphere at that time, and discovered that it had complicated vertical structure. Some evidence for hazes and some evidence for changing conditions, changing pressure in particular. These are three examples of quite a number of others that just convinced us that this was really quite a rich system. So, it was all quite promising. Graihagh - Promising indeed and your persistence obviously paid off because you got the yes for the mission and it all took off splendidly. Alan - So, it did. Alan - New Horizons is a NASA planetary mission or robotic mission that was just launched on the 19th of January to make the first reconnaissance of Pluto and then hopefully, to Kuiper Belt objects as well. The mission is the fastest spacecraft ever launched but because of the great distance, it will take about 9.5 years to reach Pluto before going on into the Kuiper belt. 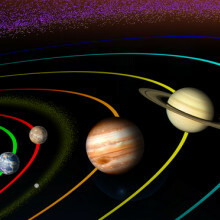 So, it's arrival will be in the summer of 2015 and when it arrives, it will be studying Pluto's system with cameras, spectrometers, and other instruments to give us a very good view of what kind of a system this is and how the different bodies are put together, what they're made of, their geology, and to study their atmospheres. Chris - What does this actually add in addition to obviously some interesting and intriguing findings of Pluto? What will it add to our understanding of that segment of our Solar System? Alan - Well, I think most importantly, we've discovered in the last decade something that was completely unexpected and that is, there's a whole new class of object out there, these miniature planets, these so-called ice dwarfs which vastly outnumber the rocky terrestrial planets the four gas giants instead of four of each of those. We think that there are hundreds of these ice dwarfs, Pluto being the first discovered and probably the best known example. So, this is going to give us our first handle on what this very populous, in fact, the most populous class of planetary body in our Solar System is all about. Chris - Is it just because they're so far away, they're so difficult to see even with telescopes like Hubble that you need to send a craft there to look at them more closely? Alan - That's exactly right. Pluto, the brightest of this population is itself 50,000 times fainter than Mars and 100 times smaller on the sky. But even over 75 years, we've only been able to eek out a very small amount of information. Chris - Do you think there are any surprises lurking out there? Alan - I think the lesson of planetary science is that we'll be quite surprised and it's embarrassing but true statement that across the Solar System, as we visited new types of bodies, we've typically found that our expectations way underestimated the richness of nature. So, I expect very much to be surprised. Graihagh - The New Horizons probe has finally reached Pluto and we've got this data back. Were you surprised? Alan - I was surprised, pleasantly so. I was surprised on several grounds. First, we didn't find any more satellites and we found that surprising because we had discovered satellite after satellite, after satellite from the Earth every time we looked harder. So I think, in the science team, there was an expectation that we would find one to many more moons in orbit in addition to the 5 that are already known, but it's clean as a whistle. We found none. We were surprised at the stunning complexity of Pluto's surface including units that are devoid of craters and telling us that they have been created in the very recent past that Pluto is still geologically active today on a massive scale. Graihagh - What does that mean? Alan - What it means is that there's still a source of energy inside the planet that drives the building of new surface units. You know, it is a fairly small planet. Let me make an analogy that if you have a small cup of coffee and a big vat of coffee, the small cup of coffee will cool off well before the big vat will because the small cup of coffee has a higher ratio of surface area to the mass of the coffee. And that lets it cool more quickly, in the same way small planets cool off - we think - more rapidly than big planets. So, mathematical models that describe the physics of these worlds predict that Pluto should have run out of that energy much earlier than today. And yet, we see evidence that it hasn't and we don't understand the source of that energy. Fortunately, 95 per cent of all the data that we took is still in the spacecraft. Meaning, there are many more clues and many more discoveries to be made to hopefully, guide us to whatever we're missing, that had been missing for decades and understanding the workings of small planets. Graihagh - Why is it taking so long for all this data to be sent back? Alan - Well by design, New Horizons had a big challenge and that was to create a mission of scope like the Voyager programme, but on a budget that was only 20 per cent as large. So, we had to make compromises. We elected at the very beginning of the project not to compromise on the amount or the quality of data, but to make our savings in other places. One example was that we used spacecraft hibernation to cut mission operations costs. Another is that we saved money on our telecommunication system. As a result, it took 9.5 years to get to Pluto and it will take us about an extra year to get all the data back to the ground. I don't find that extra 10 per cent to be daunting at all. Graihagh - No, not at all. And now that it's flown by, what's going to happen next? Where's New Horizons going? Alan - Well, we hope to choose a target about a billion miles further away in the next matter of weeks and to fire the engines or fly by in 2019. 28:07 - What is the Kuiper Belt? Philip - It's a project where we've put out lots of little kind of observatories across Australia and they look at the whole sky and image everything that comes through the atmosphere. What we do then is we're able to triangulate the orientation of anything coming through, track it back to where it comes from in the Solar System and forward, if it lands to where it lands. We get its orbit and we get a full position. Georgia - And are you also trying to use the great power of the masses to help in this project? Philip - Yes, we are. 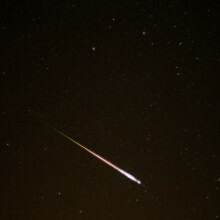 So, if you see a fireball, you can pull out your phone and hold it up to the sky, click to where it started, where it ended, the colour. You can log all of these stuff and then blip us that information and that also helps us triangulate it. If we get enough data and we can tell you your fireball came from out beyond Mars and hit the top of the atmosphere at 20 kilometres a second. Georgia - I guess it's people's first instinct anyway when they see something incredible in the skies, "Get your phone out!" Philip - Exactly. So, this actually gives you a scientific purpose to get your phone up. Georgia - Anyone taking meteorite selfies? Philip - Well, we've not actually had that yet. Georgia - When you get this data from all your observatories and maybe from people as well, what do you do? How do you go and find the asteroid? Philip - That's the hard part. So, we build this wind model and then you head out in the middle of nowhere with a team of 6, 7 people and you've just got to be very optimistic and perky for a week, and try and keep them going while you don't find it, until in the end hopefully, you do. And then you will have a bottle of wine or several. Georgia - I believe you've got something you have found with you here. Philip - This is a meteorite. This was the first one we found. This kind of proves that it works. Georgia - It looks and feels a bit like a sort of shiny lump of coal. You mentioned that this little guy - does he have a name? Philip - Yes, this Bunburra Rockhole. The meteorites normally get named for the nearest post office, needless to say, the nearest post office is I think about a thousand kilometres away from where this was found. So, it isn't really narrowing down. Then you get named for the nearest topographic feature. Now again, I'd encourage people to take a look at the Nullarbor. There's no topography. So, from that point of view as well, it's a complete disaster. Georgia - You'll just end up naming them all desert. Philip - Yeah. I mean, the nearest thing on the map with any name was 40 kilometres away which was like kind of a little sinkhole in the limestone, and that's the only thing with any name which is kind of bonkers. Georgia - Once you have this rock and you've used your tracking to work out where it's come from, what do you do with it once you find it? Philip - We'll look at the isotopic composition, the chemistry, we'll use microscopy, we'll do CT scans over the thing. So, there's a ton of analyses that we can do to kind of build up a picture of its whole history. So, the exciting thing about - I guess, there's a few things. So, we've got an orbit for this and the orbit was very, very weird. The orbit is actually almost the same as Earth's orbit. So pretty much, the whole orbit for this one is interior of the Earth's orbit. It doesn't go anywhere near the asteroid belt and that's bizarre. The composition of the thing is also really weird. So, the best we can tell is that this might be, it's not like a dead ringer for the precursor material that went in to make the Earth. But this sort of rock is part of that story. So, we're trying to work out what the precursor was that got the Earth got built from. This helped us get a little bit closer to that. So, having the orbit and the rock, were really, really useful for that. Georgia - What's the furthest you've ever got anything from? Philip - The furthest thing, I've never held it in my hand, but it was material from the Stardust mission. So, I was looking enough to be part of the preliminary analysis team for the Stardust mission and the goal in that mission which was very successful was to bring back dust from comet Wild-2 and the spacecraft flew through the tail of the comet, got pretty close actually and got pretty battered, and then put that in a capsule, reentered the Earth's atmosphere and then a whole bunch of researchers from around the world kind of joined together to analyse it. It was fantastic. This was when I was back in the UK and I was waiting for my samples and I was expecting some very official NASA kind of delivery man, kind of Men in Black-type situation with the briefcase locked to his wrist. It came in a DHL padded envelope. Georgia - No expense spared. Philip - No! but still very, very cool to get samples of a comet and a student of mine, Penny Wozniakiewicz did an amazing job analysing that material and people at Natural History Museum as well, colleagues of mine did a wonderful job analysing it and being part of that whole process with other researchers, an incredible amount of information has come out. It's been a really successful mission. Georgia - And this was out from as far as the Kuiper belt. Would any specimens from the Kuiper belt actually fall to Earth? Is that something you're looking for? Philip - We go through streams of comet debris on a regular cycle which are meteor streams. Most of that stuff is dust which means that it'll almost all burn up in the atmosphere really high up. But some of it is chunkier and there's one stream in particular, the germinids, it's a comet that's been cooked up a lot by many close approaches to the sun. So, it's certainly not in as good shape as it was originally, but what that's done is the material is denser now and it looks like some of that should be able to make it to the Earth's surface. So, my kind of holy grail if we're ever going to find anything would be that we'd see something come in, we'd put those images together, we'd calculate its orbit. It's orbit would match one of these germinid meteors and we work out it had landed, and we'd going to pick it up, and that would be absolutely incredible. It wouldn't be nearly as pristine as some of the others, but technically, that's possible. Georgia - Best case scenario, what could you learn from a meteorite that have come all that way? Philip - That's a really good question. Best case scenario, I got into planetary science and studied meteorites because as a geologist, it felt like a lot of the things in geology, we'd worked out pretty well. We know the kind of grand unifying theory for geology, plate tectonics and it's been kind of a case of putting the finishing touches to that really. But in terms of what happened before planets got made, or how we made planets, or why the Earth has the composition that it does, we really have very little idea. So, if you ask someone, "How do you make terrestrial planets? How do you get a planet that's got a very nice mix of rock and ice and water, and organic material?" Well, no one knows. There's dozens of different options. I find that really, really exciting as kind of a young researcher so that's why I got into it. So, in the best possible case, we'd work out why we have terrestrial planets in the inner Solar System, why that process of depleting the inner solar system in what we call volatile elements, why that happened, and that's a big part of the key to... if that's a normal part of planet formation, then it means that rocky planets are common in the universe and that would be quite exciting to know that. Philae touched down on a comet back in 2014 but what has this revealed about the Kuiper Belt? Ian - The reason you want to go to a comet is that these are the bits of debris and God knows what else that are left behind from that process 4.5 billion years ago when the sun formed and the planets formed, and all the rest of it. Graihagh - That's Ian Wright from the Open University. 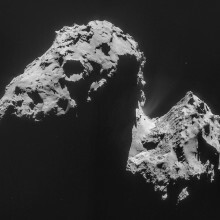 He's one of the scientists involved with Rosetta, a probe that dropped Philae onto the surface of a comet called 67P. 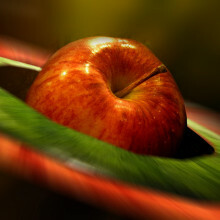 Ian - It was an object that would've come from the Kuiper belt at some point. These bodies stay in Kuiper belt for billions of years before they get kicked out. That happens because of a chance interaction of two bodies or a body getting too close to something else and then they get put on a trajectory that takes them in towards the sun and has been going around the sun for a few times ever since. Graihagh - So, tell me the story of how this mission was dreamed up in first place and the journey of Rosetta because it's taken - well, it left back in 2004, didn't it? So, it's taken 10 years to get there. Ian - Yeah. ESA had this very successful mission to comet Halley in 1986. Pretty much straight after that, people started thinking about what should we do next. And so, Rosetta was born as a comet Nucleus sample return mission. So, this was not merely going to go to a comet. It was going to drill down, collect the core, and bring it back to Earth. It turned out that this was technologically quite challenging. So the question was, "well, if you can't bring the sample to the instruments, can you take the instrument to the sample?" that's ultimately what we had to do. Graihagh - When it finally did touch down, how did you feel? It must have been an incredible result. Ian - Yeah. I was actually out at ESOC which is where the press event was. And of course, the champagne was flowing quite nicely. Graihagh - I can imagine. Ian - But during the course of that evening, we actually learned that the thing had finally landed. So, it was a very nerve wrecking time, very strange mix of emotions. For us, even though it was that fairly bumpy landing, we actually got our first data back. Graihagh - What was the data? Ian - Almost as soon as we touched down, we were going to switch the instrument on and the idea was, we'd have a sniff around what was coming up around the spacecraft whether those would be gases or dust, or volatiles or whatever. And then we spent the next few weeks and months, trying to understand what it all meant. Graihagh - And what did it mean? Ian - Well, straightaway, you can see some regularity in the results. We get something called a mass spectrum and it measures the masses of compounds and the amount of each mass. You can see a regularity in this spectrum which sort of straightaway leaps out. So, there's an organic polymer that we analysed which is, we believe is a formaldehyde polymer. It's very interesting in its own right because formaldehyde is implicated in various processes around the origin of life. And also, formaldehyde is detected in interstellar space. So, it looks like we've been analysing materials from before the birth of the Solar System and it's slightly humbling to sort of be doing that. Graihagh - Yes, I can imagine quite. I suppose the whole organic and building blocks of life leads into the whole idea of panspermia, that life perhaps was brought to us from comets rather than forming on Earth itself. Ian - Well, there's not really anything on the Rosetta spacecraft that is there to address the issue of there being life in the comet. These are relatively primitive organic compounds. These are the building blocks of the more complex molecules from which life ultimately evolved. In a way, it's far more exciting because this is what life looked like before life got going. In terms of trying to understand the origin of life, it's tremendous to have that sort of insight and information into what would've been there at the time when it happened. Graihagh - So, 67P has been a bit of a time machine almost for us. Ian - Absolutely. That's one of the reasons why we went to the comet and it is absolutely like looking back in time. It's tremendous. Graihagh - If we zoom out a little bit from 67P and look at the Kuiper belt more as a whole, what can we infer, what we have learned about 67P and apply across the Kuiper belt? Is it likely that we're going to have these formaldehydes and these building blocks there too? Ian - We can say as a starting assumption that it is, but of course, we won't know for certain until we go and visit others and study them in this kind of detail. I think the other interesting thing is to see what kind of crossovers and tie-ins that there are between the data from the New Horizons mission with what we've got from Rosetta. Certainly for youngsters, people coming in to the subject to work on those kinds of things, this is kind of work that will easily take 5 or 10 years now to accomplish. 49:21 - Why should we explore space? Should our time and money be going towards projects that are closer to home? Why should we explore space? David - It was more exhilarating, more exciting than I ever believed possible. We were in a packed room and many of the people standing around us had been involved in the project in one way or another for one or even two decades of their lives. And so, there was this extraordinary, very, very human eruption of emotion when the confirmation came through that the lander had successfully touched down. We were standing very close to Professor Monica Grady of the Open University, head of planetary sciences there. Her department and her husband is the principal investigator on one of the instruments on the lander. She was just unrestrained in her joy. I had my first on air hug from her. I think for me, it was a moment that showed the wider world that scientists have very, very human emotions. They have ambitions. They have frailties. They are responsive as any of us would be to moments of high intense drama. I think the public reaction to seeing Monica's reaction and the reactions of everybody in the control room, and mission control, and the rest of that room illustrated that there is something valuable for us humans just about attempting very difficult things and exploring unknown worlds, and having a shared experience of joy when it works. For me, it was one of the highlights of my career. David - So 10 years ago, right? Chris - Exactly, right. So, the concept of something taking that long to come to fruition, you think a PhD's long and that's 3 years and then this is three times that more, it is quite hard to grasp. 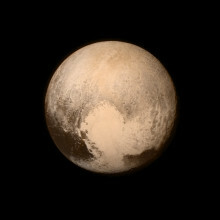 But then we saw a similar reaction when we saw the first proper pictures of Pluto as that went past. You were there too, weren't you? David - I was there in Maryland at Johns Hopkins University which was managing the mission and Alan Stern was there obviously. You got to admire the tenacity of the man because he kept suggesting to NASA these missions to Pluto and they kept swatting him away and rejecting him. He described the process of dealing with the rejection, taking stock, getting over the hurt, coming back a few years later with another proposal, and was obviously delighted when the mission was approved. It's easy perhaps to be a bit cynical and to think this is a bit cheesy and certainly, it's quite flag waving over in America. Not everybody who wasn't American kind of appreciated that. But I do think there's something important about finding ways to make science exciting. And if this is a way, I think it's to be applauded. Chris - Not everyone was enthusiastic though. There was a bit of negative energy coming back, wasn't there? David - That's right. I mean, in the middle of the sort of Twitter storm and sort of nearly everybody is apparently sharing in the excitement, there'd always be someone who would lob in a little comment along the lines of, "Why bother? Why do we a.) Need to be excited, b.) More importantly, spend any money?" I feel it very keenly certainly. In the newsroom, there are debates amongst the editors about, "Is this stuff important? Do we need to spend any of our dwindling news coverage budget on a space mission to a very distant world?" I mean, I in a blog, responding to those criticisms, tried to make the case, but there's something about human nature which leads us to want to explore. If a door is half open, most of us would want to look. Most of us I think would want to see Pluto in detail and get to know our scientific neighbourhood. I think that's probably why the likes of Scott and Shackleton and Nansen, the great explorers attracted such an enormous following because they were taking humanity beyond existing boundaries into unchartered territory and I think that's something that appealed to a great number of people. When I wrote that blog, quite a number of comments came in and people wrote to me. One comment in particular came to me by email which was sort of saying, "Well done and thank you for doing it" but that I'd miss the point. For him, the main point was very, very exciting space missions surely serve his bigger purpose of being an inspirational springboard for young careers in science and engineering. Probably, the most robust defence of this mission is a combination of, "Aren't we just curious species?" and secondly, if one buys into that argument, that we're going to need clever people to engage in difficult challenges in science and engineering. Surely, this is a great way to try and do that. Chris - What is next on the space agenda, looking forward from here on in? What have we got coming up? David - Well, you've mentioned Tim Peake and I think that's a fascinating mission. We've had Brits who became American citizens in order to join NASA and go into space. But Tim Peake is Britain's first official astronaut and he's got a 6-month mission up to the Space Station. His launch date is set for mid-December. I think it marks an enormous and interesting change in British attitudes to manned space flight. For a very long time, successive British governments just didn't sort of get it. And then I think much more recently, there's been this massive recognition in government circles that rather quietly, Britain has a very impressive network of companies of different sizes, and different institutes and different university departments, very successfully engaged in different aspects of space. I think if you do have a British human presence in space, it acts as a kind of way of bringing all these disparate activities across the UK together. It provides a kind of figurehead if you like. I'm looking forward to it. I think that'll be probably for a British space journalist, that's probably the next big thing on the space diary which we're all looking forward to. Next How can a headless chicken run?